"Reconciliation is and will continue to be a focus of my leadership… We have a duty of care to act in the best interest of all." Fine words, indeed, uttered by Mary Lou McDonald last month, when she was in her cuddly phase, addressing a crowd of unionists in Queen's University. And then, as the song goes, she had to spoil it all by saying something stupid. Or, in this case, doing, as she stood grinning like a Cheshire cat behind a banner stating ''England get out of Ireland'' in America, on St Patrick's Day. She may as well have stood and chanted "Brits out!" for good measure. The photo was posted on the Sinn Fein Twitter account with the words, "No explanation needed". Ironic, then, that it spent last week explaining itself, and blaming those who raised an eyebrow - for apparently misinterpreting it - rather than taking responsibility for a silly error of judgment. You cannot parrot a mantra of "respect, equality, integrity" for years, and then send a two-finger salute to those who feel an affinity with being British - and want to live under British rule, by provocatively posing with a banner like that. Even Alex Kane, who is far from an extreme unionist, and who accepted an invitation to speak at a Sinn Fein event a few years ago, explained why he was offended last week: "I am, by birth and by continuing choice, a citizen of the United Kingdom. It remains the backbone of my identity; that sense of who I am and what I want to be. So, when Mary Lou stands behind a banner saying 'England get out of Ireland', it sends a message to a UK citizen like me. That message is simple and unambiguous: a key part of my present identity would not be welcome in the sort of Ireland Sinn Fein wants." There were others who made their views known across the political spectrum. The Alliance party, once known as the "sit on the fence party", because it was so moderate, took offence, as did my own party, the SDLP. Terry Wright, a "civic unionist" (we haven't managed yet to stop putting labels on people according to where they come from), had actually invited McDonald to speak to unionists a matter of weeks ago. He had to defend his invitation on television after some from within his own community took offence, yet felt compelled to write an open letter addressed to her through a Northern newspaper a few days ago in which he said: "You would do well to remember that there is historically, a thin line between 'England out' and 'English out'." He further went on to say: ''It is hard to shake hands with a closed fist. As informed by extensive discussion with other civic unionists, I believe that they are committed to… an inclusive community for everyone… I am disappointed to find that Sinn Fein under your leadership is not at the same point." It's hard to see how Mary Lou could have caused more damage to engagement than this. By posing for that photo, she alienated the very people Sinn Fein was so keen to capture in its united Ireland argument - ripe for the persuading in republican eyes in the middle of a Brexit meltdown. She might as well have slapped their faces for them. At this point, any other political leader, realising a problem, would have set about trying to limit the damage. Instead, the Shinners doubled down, implying that they couldn't understand the outrage because the banner had been around since the 1940s. Hello? People waved Hitler flags in the 1940s, and we don't see political leaders swearing allegiance to this message for good reason. Times move on. So should responsible leaders. As Mary Lou said herself at that February meeting: ''Change happens and the challenge that we face is to manage that change." It's not as if Sinn Fein would not have been aware of the potential for offence. In 2016, there was an outcry over the banner appearing in the march at all, with some labelling it "sectarian". It is inconceivable that Sinn Fein missed that particular furore. Instead, it deliberately courted controversy. The row has rumbled on, with McDonald's deputy, Michelle O'Neill, having to defend her party leader last Thursday. It wasn't about English people, she said, but about ending partition. Sometimes it isn't about what you mean, but how you are perceived. A savvy politician who had been crafting her image as inclusive would have stayed clear. Mary Lou marched in, and then refused to back down. Both have been hallmarks of her "leadership" to date. Both are incredibly stupid. Her predecessor also suffered from foot-in-mouth syndrome, but he was largely given a pass, because nobody expected any better. When the new shiny leader came along, people set a higher bar. She has failed them abysmally. 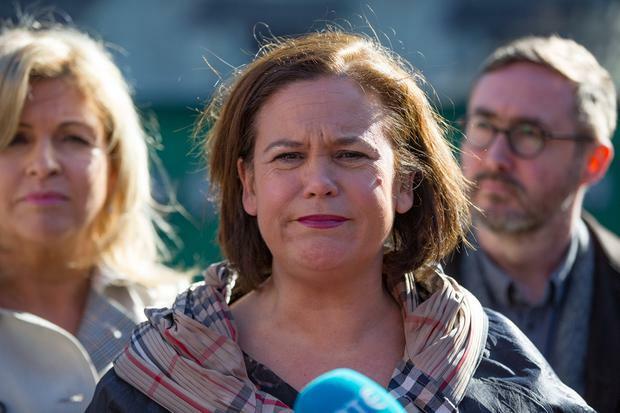 While Gerry Adams has been reduced to talking to bushes and releasing cookbook recipes, making a laughing stock out of himself in the process, Mary Lou was supposed to get Sinn Fein into shape. She has been an abject disappointment. This is a woman who described the antics of Westminster as "a shambles", without a hint of irony. This same woman refused to leave her Dail seat for hours after being suspended from the House by the Ceann Comhairle, but couldn't wait to get into her seat when Mary Hanafin sat in it for a group photograph. Neither were good judgment calls, both opening her up to ridicule. It all started out so well for her, and she made a reputation for herself as a forensic performer on the PAC committee, so naturally, most thought that her skills would translate to her new role. But hectoring people in a small room and firing questions at them does not a political leader make. Politics, as someone once said, is the art of compromise. Isn't it just as likely that her skills were suited to the adversarial nature of that particular committee but not to political leadership? This is the same woman who was found to have abused her Dail privilege over the Ansbacher debacle. It's Trumpian populist politics. That brass-necked 'do first, never mind the consequences later, and never apologise' approach may work in some parts of the US, but not in Ireland. While everyone else is playing senior hurling, Mary Lou is still on the side-lines, trying to pick up the sliotar. One of her problems is that she still isn't viewed by west Belfast republicans as being as republican as the rest of them. So desperate was she to prove her credentials to the base, that a number of years ago she introduced a story to the media about her great uncle whom she never met, who was apparently shot in the Curragh camp in 1922. So, every now and again she says or does something that appeals to Sinn Fein republicans, and repels everyone else. Like her assertion that she believed the "people who volunteered to the IRA were decent", or standing on a podium at the Derry Volunteers dinner, or shouting "up the rebels". Just imagine if Fine Gael had brought Sinn Fein into government at the last election. They would have had to defend every scandal, including her inadequate response to my Ombudsman report, and the recent controversy she caused in the middle of a policing recruitment process, which resulted in the NI Policing Board having to take legal advice. As I described in a tweet last week, she has a whiff of a radicalised west Belfast teenager who is gleefully trying to paint herself as a hardliner. Growing up in west Belfast, it was hard to escape republican radicalisation, and I've marched behind a banner or two myself over the years. But, like most other sensible people, I eventually grew up. Mary Lou lived a world away from west Belfast, and is almost 50. What's her excuse? If she wants to portray herself as Markievicz lite, fine, but it is impossible to reconcile juvenile Mary Lou with the more mature Mary Lou who speaks of seizing an "historic opportunity to break from the past". Only she can decide which side of her mouth she wants to talk out of, but that requires her to consign the other to history. Perhaps she will choose wisely. Given her poor judgment to date, I wouldn't hold my breath.